Background: Hemodynamic monitoring is an essential part in the treatment of critically ill patients. Establishment of intravascular volume and creation of a normal systemic perfusion are the most important part to reduce the risk of organ failure and mortality. This study aimed to determine the correlation between the inferior vena cava (IVC) sonographic indices and the central venous pressure (CVP) to provide a useful guide for noninvasive intravascular volume status assessment in children. Materials and Methods: Target sample of children who were admitted to the pediatric critical care unit and required CVP monitoring were enrolled in this study. The collapsibility index (CI) and IVC/aorta (AO) ratio, from bedside ultrasonography measurement of the IVC, were calculated. Results: Of the 70 participants, 22 patients (31.4%) revealed a CVP of 8 mm/Hg or less and 48 patients (68.6%) revealed a CVP >8 mm/Hg. Fifty-six patients (80%) had an IVC-CI of 0.5 or greater and 17 patients (24.3%) had an IVC/AO of 0.8 or less. IVC-CI index is 45.5% sensitive and 91.7% specific with positive predictive value of 71.4 and negative predictive value of 78.6 to predict CVP <8, and the IVC/AO index is 50.8% sensitive and 87.5% specific with a positive predictive value of 64.7 and a negative predictive value of 79.2 to predict CVP <8. Conclusion: Based on the present finding, the IVC sonographic indices provide a useful guide for noninvasive intravascular volume status assessment in children. The use of inferior vena cava (IVC) sonographic indices to assess the intravascular volume in a wide range of adult patients has been studied in several researches since 1979 and is associated with the acceptable results. Of present, in the adult emergency medicine and ICU, these indices are widely used as a noninvasive, rapid, and reliable method for assessing the volume status. Studies on IVC index such as IVC diameter, IVC collapsibility (decreased IVC diameter at inspiration time), and IVC to aorta (AO) diameter were performed, and each of these indices was compared with the CVP.,,,,, Considering that studies in this field are very limited in children and that study has not been conducted in accordance with the results of the extensive studies performed in adults, we aimed to compensate by eliminating or minimizing the confounding factors in measuring CVP and IVC sonographic indices, measure these indices in children, and compare them with CVP. The study was conducted from May 2016 to March 2017 for 11 months for the hospitalized children in the ICU of Tehran Children's Medical Center. Inclusion criteria were the children between 1 month and 12 years, admitted in these critical care units, with indwelling central venous catheter for invasive hemodynamic monitoring, Patients under mechanical ventilation receiving maximum positive end-expiratory pressure (PEEP) of 6 cmH2O, Patients receiving vasoactive agent as a continuous infusion with epinephrine <0.05 μ/kg/min and dopamine <10 μ/kg/min and Central vein catheterization under 24 h.
The patients with abdominal pathology, Limitation in the supine position or access to intended sonographic view were excluded. The target patients participated in the study based on the defined criteria, and the demographic data including age, gender, primary diagnosis, intubation status, the site of central line insertion, pressure needed to avoid collapsing of alveoli in end-expiratory (PEEP) number in intubated patients, use of sedation and/or vasopressors, and CVP level were registered in the questionnaire. After preparing the patient for bedside ultrasonography (BUS), the two interns of the 2nd year, who were trained by an expert pediatric cardiologist, measured the sonographic indices. The BUS measurements were obtained with a TOSHIBA-Aplio system using the 5 MHz phased array transducer. The patient was placed in the supine position and all measurements were collected in this position. First, in the subxiphoid sagittal view, the transducer was placed in the subxiphoid region and the liver was used as the acoustic window, and distal to the junction of the IVC and hepatic vein, M-mode was used to capture a 15s cine loop of the IVC over 5 respiratory cycles. The maximal and minimal anterior–posterior IVC diameters between the two internal walls of the Venus were measured, and the collapsibility index (CI) was calculated according to this formula ([max IVC–min IVC]/max IVC × 100%) [Figure 1]. 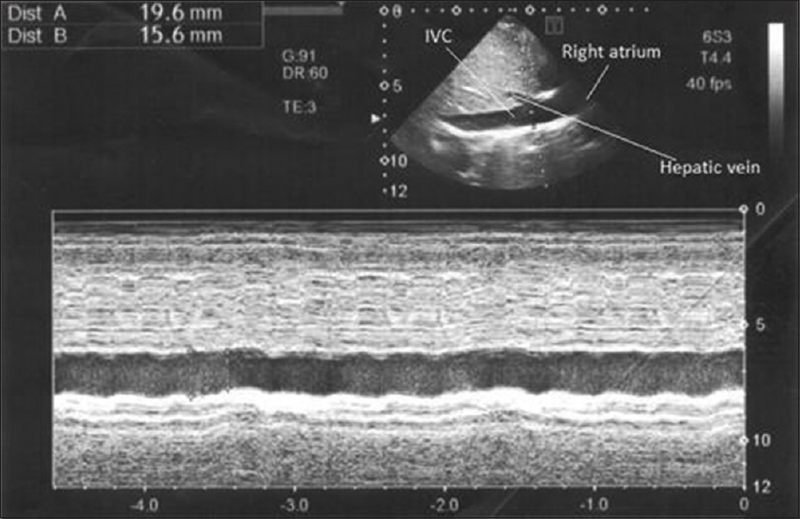 Furthermore, in transverse–subcostal view, the transducer was placed in the subxiphoid region, and the liver was used as the acoustic window to visualize the AO at the level of regression of the left renal artery from the AO. The maximal anterior–posterior diameter of both IVC and AO were measured to calculate the IVC/AO ratio [Figure 2]. In any step of sonography, images were printed and attached to the questionnaires. To match with the previous literature, dehydration was considered as CVP of 8 mmHg or less, a CI of 50% or greater, and IVC/AO of 0.8 or less. At the end of sonography, the CVP value that was obtained during the sonography examination by the nursing staff was reported. This measurement was obtained in the supine position through digital transduction of the pressure tracing of the distal port of the central line, and the numeric value was recorded after the transducer was rezeroed in the midaxillary line. The study investigators were blinded to CVP measurements. Data were collected in 21 versions of SPSS) IBM, NY, USA) and was statistically analyzed. Descriptive statistics for all qualitative variables was calculated. Chi-square test and Pearson correlation coefficient were used to determine the relationship between CVP and sonographic IVC indices, and P < 0.05 was considered as statistically significant. Over the course of the study, according to the inclusion and exclusion criteria, 70 patients were included (54.3% male: mean age 36.8 ± 40.7 standard deviation months). About 47.1% of patients received vasoactive agent and 38.6% were sedated. The right femoral vein was mostly used as the CVC insertion site. The mean CVP maintained was 10.64 ± 3.85 mm/Hg with a CI of 35.3 ± 16.3 and IVC/AO of 1.09 ± 0.4. A total of 22 patients (31.4%) revealed CVP of 8 mm/Hg or less and 48 patients (68.6%) indicated CVP >8 mm/Hg. A total of 56 patients (80%) revealed IVC-CI of 0.5 or greater and 17 patients (24.3%) indicated IVC/AO of 0.8 or less. Baseline characteristics of the patients are summarized in [Table 1]. 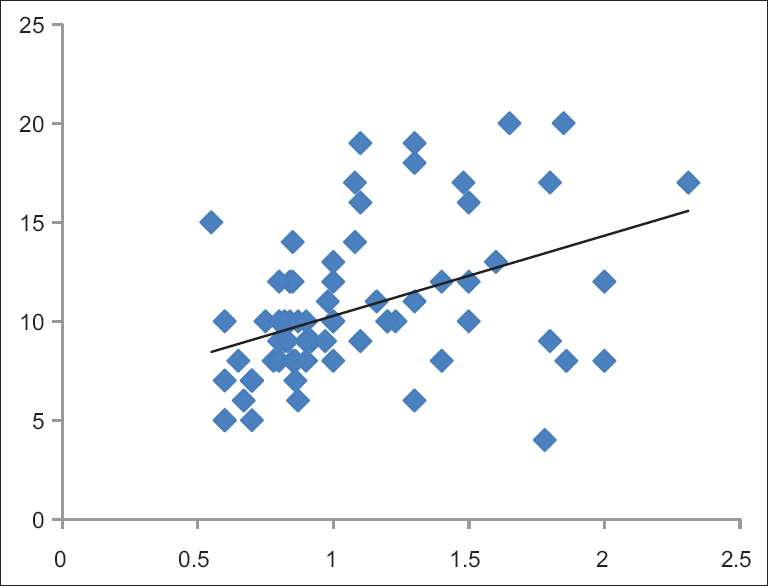 Pearson correlation was used to determine the relation between CVP values and the IVC-CI and IVC/AO indices. 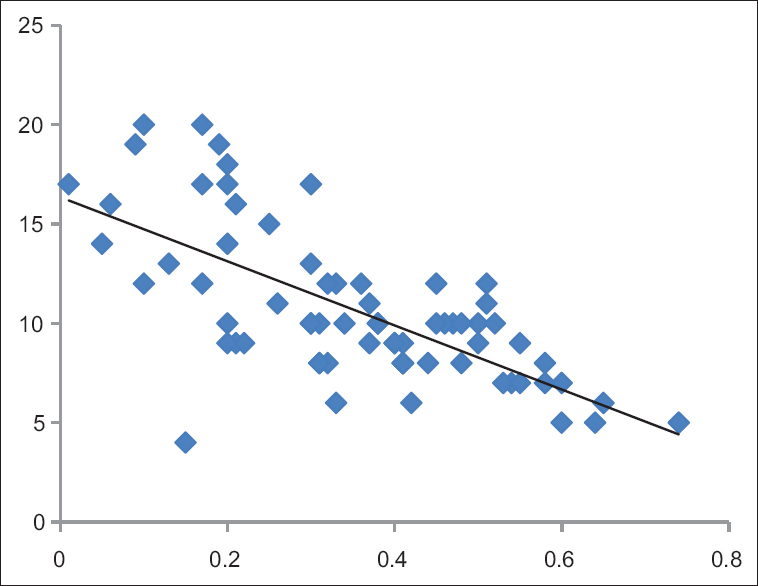 A strong negative linear correlation was observed between the CVP (10.64 ± 3.85 mm/Hg) and IVC-CI index (35.3 ± 16.3), which was statistically significant (P< 0.001 and r< 0.685), as presented in [Figure 3]. A strong positive linear correlation was observed between the CVP (10.64 ± 3.85 mm/Hg) and IVC/AO (1.09 ± 0.4), which was statistically significant (P< 0.001 and r < 0.423), as presented in [Figure 4]. To assess the relation of CVP and IVC-CI and IVC/AO, IVC-CI variable was categorized in IVC-CI ≥0.5 and IVC-CI <0.5 and IVC/AO variable was categorized in IVC/AO <0.8 and IVC/AO >0.8. Moreover, these cases were compared to CVP <8 and CVP >8 groups, which indicated a significant relation (P< 0.001). [Table 2] compares the IVC sonographic indices with the CVP measurements. IVC CI is 45.5% sensitive and 91.7% specific with a positive predictive value of 71.4 and a negative predictive value of 78.6 to predict CVP <8 mm/Hg, and IVC/AO index is 50.8% sensitive and 87.5% specific with a positive predictive value of 64.7 and a negative predictive value of 79.2 to predict CVP <8. This data is presented in [Table 3]. Quick evaluation of the intravascular volume in the critically ill pediatric patients is essential since in the case of missing diagnosis of the decrease in intravascular volume, presumably the patient may enter a shock position. Using BUS has several benefits over the standard CVP measurements, and it is possible to calculate the intravascular volume with lesser time and complications compared to accessing the central vein, using it as a guide to start the treatment and evaluate response to the treatment. 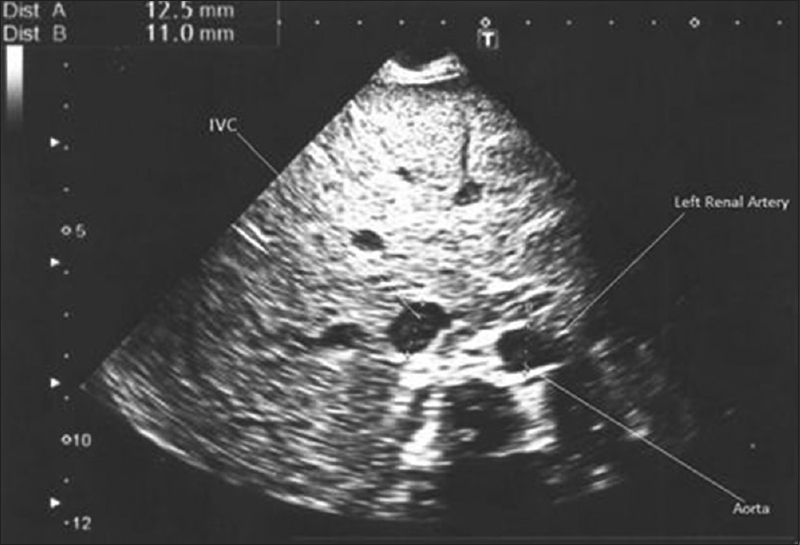 This study is the second survey on children relating to the evaluation of IVC ultrasonography criteria (IVC collapsibility, AVC/AO) using CVP. A significant relation has been observed between IVC and CVP in different studies on adults. For example, in one of the latest studies, Ciozda et al. (2016) used a systematic method for evaluating the results of 21 last studies and found a considerable relation between IVC diameter and IVC collapsibility by comparing the calculated CVP (C-static = 0.5–0.76 for IVC diameter and 0.66–0.93 for IVC collapsibility). It was concluded that measuring the IVC collapsibility and IVC diameter can be considered as a reliable method for calculating the intravascular volume as a substitute for measuring CVP in adults. In pediatric studies considering the IVC collapsibility indices and ratio of IVC/AO and its comparison with CVP, Lerrain Ngr et al. (2012) studied 51 patients in pediatric ICU (PICU) of Montefiore center, New York. No significant relation was observed between the IVC indices with IVC/AO ≤0.8, IVC-CI ≥0.5, and CVP <8 mm/Hg; therefore, using ultrasonography to evaluate the decrease in the intravascular volume in pediatric patients was reported as an unreliable method. Furthermore, we excluded the postoperative abdominal pathology patients and patients with intra-abdominal pathologies, which can reveal increased intra-abdominal pressure and affect the mentioned gradient. Since the vasoactive drugs can indicate vasoconstriction effects on the vascular wall, and thus influence IVC and CVP, patients receiving vasoactive medication with doses less than sufficient for activating the alpha receptors and starting vasoconstriction, were included in the study. Small sample size according to the inclusion criteria was one of our limitations. Sedative drugs in patients under mechanical ventilation indicated another limitation of our study because its effects on the vascular wall during CVP measurement and IVC indices are not predictable according to the receiving dose. We could not exclude or define an inclusion criterion for these patients. 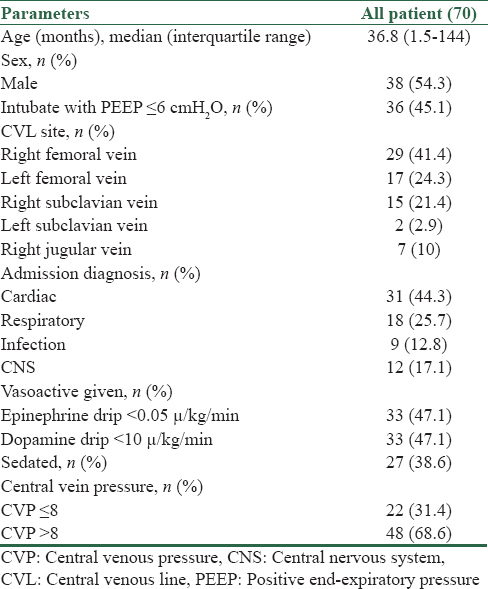 In 65.7% of the included patients, CVP was measured using the femoral vein, which can affect the calculations through jugular and subclavian veins. In this study, the number of included patients with severe dehydration who needed critical treatment was not dominant (22 people or 31.4% had CVP <8) because the patients were admitted in PICU and benefited from partial stability; however, changes in the intravascular volume was sufficient to be tracked by ultrasonography. As it was reported in the previous studies, patients with CVP <10 have a higher chance of responding to the hydrotherapy challenge due to an increase in the heart output, and therefore, changes in the intravascular volume and IVC ultrasonography indices are more tangible;, hence, it seems that repeating this study in the emergency room and on patients who need acute treatment intervention can be considered in the future studies, and presumably, we can compare the changes in CVP and IVC ultrasonography indices before and after treatment. In addition, using bigger sample with more limitations regarding inclusion of patients under mechanical ventilation and exclusion of effects of PEEP and sedative drugs can minimize the confounding factors in this study. Based on the present finding, we can find significant correlation between the IVC sonographic index including IVC-CI and IVC/AO with CVP. The authors conclude that the IVC-CI and IVC/AO indices can provide a useful guide for noninvasive intravascular volume status assessment of the pediatric critically ill patients. It seems that IVC sonographic indices and CVP measurements in bigger sample of patients who need acute treatment intervention before and after treatment can be helped to assess the sonography roles in the pediatric critically ill patients in the future studies. Brierley J, Carcillo JA, Choong K, Cornell T, Decaen A, Deymann A, et al. Clinical practice parameters for hemodynamic support of pediatric and neonatal septic shock: 2007 update from the American college of critical care medicine. Crit Care Med 2009;37:666-88. Ronald A, Bronick I, Neil C. Spenceley. Hemodynamic monitoring. In: Nicolas DG, Shaffner DH, editor. Rogers Textbook of Pediatric Intensive Care, 5th ed. Wolters Kluwer, copyright 2016. p. 1120-34. Greenbaum LA. Fluid and electerolyte disorders. In: Behrman RE, editor. Nelson Textbook of Pediatrics. 20th ed. ELSEVIER, Copyright 2016. p. 346-7. Rothrock SG, Green SM, McArthur CL, DelDuca K. Detection of electrolyte abnormalities in children presenting to the emergency department: A multicenter, prospective analysis. Detection of electrolyte abnormalities in children observational national study (DEACONS) investigators. Acad Emerg Med 1997;4:1025-31. Vega RM, Avner JR. A prospective study of the usefulness of clinical and laboratory parameters for predicting percentage of dehydration in children. Pediatr Emerg Care 1997;13:179-82. Narchi H. Serum bicarbonate and dehydration severity in gastroenteritis. Arch Dis Child 1998;78:70-1. Teach SJ, Yates EW, Feld LG. Laboratory predictors of fluid deficit in acutely dehydrated children. Clin Pediatr (Phila) 1997;36:395-400. Ooi SB, Koh-Tai BC, Aw TC, Lau TC, Chan ST. Assessment of dehydration in adults using hematologic and biochemical tests. Acad Emerg Med 1997;4:840-4. Gorelick MH, Shaw KN, Murphy KO. Validity and reliability of clinical signs in the diagnosis of dehydration in children. Pediatrics 1997;99:E6. Steiner MJ, DeWalt DA, Byerley JS. Is this child dehydrated? JAMA 2004;291:2746-54. Inha R, Nadel S. Niranjan “TEX” Kissoon and Subhadra. ROGER'S Textbook of Pediatric Critical Care: Recognition and Initial Management of Shock. 5th ed. Wolters Kluwer, copyright 2016. 2016. p. 386-90. Schexnayder SM, Khilnani P, Shimizu N. Invasive procedures. In: Nicholas DG, Shaffner DH, editor. ROGER'S Textbook of Pediatric Intensive Care. 5th ed. Wolters Kluwer, copyright 2016. p. 363-6. Lyon M, Blaivas M, Brannam L. Sonographic measurement of the inferior vena cava as a marker of blood loss. Am J Emerg Med 2005;23:45-50. Yanagawa Y, Nishi K, Sakamoto T, Okada Y. Early diagnosis of hypovolemic shock by sonographic measurement of inferior vena cava in trauma patients. J Trauma 2005;58:825-9. Nagdev AD, Merchant RC, Tirado-Gonzalez A, Sisson CA, Murphy MC. Emergency department bedside ultrasonographic measurement of the caval index for noninvasive determination of low central venous pressure. Ann Emerg Med 2010;55:290-5. Stawicki SP, Braslow BM, Panebianco NL, Kirkpatrick JN, Gracias VH, Hayden GE, et al. Intensivist use of hand-carried ultrasonography to measure IVC collapsibility in estimating intravascular volume status: Correlations with CVP. J Am Coll Surg 2009;209:55-61. De Lorenzo RA, Morris MJ, Williams JB, Haley TF, Straight TM, Holbrook-Emmons VL, et al. Does a simple bedside sonographic measurement of the inferior vena cava correlate to central venous pressure? J Emerg Med 2012;42:429-36. Kosiak W, Swieton D, Piskunowicz M. Sonographic inferior vena cava/aorta diameter index, a new approach to the body fluid status assessment in children and young adults in emergency ultrasound – Preliminary study. Am J Emerg Med 2008;26:320-5. Ciozda W, Kedan I, Kehl DW, Zimmer R, Khandwalla R, Kimchi A, et al. The efficacy of sonographic measurement of inferior vena cava diameter as an estimate of central venous pressure. Cardiovasc Ultrasound 2016;14:33. Sridhar H, Mangolorz P, Chandrase Karan VP. Caval aorta index central venous pressure correlation in assessing fluid status. IRSN Emerg Med 2012;2012:5. Naghipour B, Faridaalaee G. Correlation between central venous pressure and inferior vena cava sonographic diameter; determining the best anatomic location. Emerg (Tehran) 2016;4:83-7. Ng L, Khine H, Taragin BH, Avner JR, Ushay M, Nunez D, et al. Does bedside sonographic measurement of the inferior vena cava diameter correlate with central venous pressure in the assessment of intravascular volume in children? Pediatr Emerg Care 2013;29:337-41. Natori H, Tamaki S, Kira S. Ultrasonographic evaluation of ventilatory effect on inferior vena caval configuration. Am Rev Respir Dis 1979;120:421-7. Thanakitcharu P, Charoenwut M, Siriwiwatanakul N. Inferior vena cava diameter and collapsibility index: A practical non-invasive evaluation of intravascular fluid volume in critically-ill patients. J Med Assoc Thai 2013;96 Suppl 3:S14-22. Bshop NB, Bruce M, Wald G, Daniel A. Noherman pharmacology of the cardiovascular system. In: Zimmerman F, editor. Pediatric Critical Care. 5th ed. ELSEVIER, copyright 2017. p. 365-6. Magder S, Bafaqeeh F. The clinical role of central venous pressure measurements. J Intensive Care Med 2007;22:44-51. Machare-Delgado E, Decaro M, Marik PE. Inferior vena cava variation compared to pulse contour analysis as predictors of fluid responsiveness: A prospective cohort study. J Intensive Care Med 2011;26:116-24.